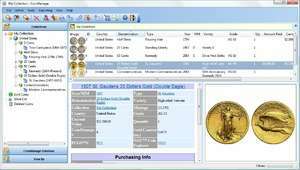 CoinManage Coin Collecting Software is a complete inventory program for the coin collector. Save many hours of data entry by simply picking from the provided listings of more than 18,900 US, Canadian & UK coins. CoinManage supports over 1200 coin images are provided to help identification. Now currently includes an integrated Report Designer and the best eBay coin search you will find. CoinManage 2015 is a shareware program and can be used as a demo to try the software until the free trial period has ended. A full version of the program is available after the trial period ends. For security reasons, you should also check out the CoinManage download at LO4D.com which includes virus and malware tests. Additional screenshots of this application download may be available, too.